KIEV, Ukraine -- About 100 activists have staged Ukraine's first gay pride march in the capital Kiev, ignoring a court ban. Gay rights activists marched for about 30 min away from the city centre. "This can be considered a historic day," Olena Semenova, one of the organisers, said. Police arrested 13 people for trying to break up the rally - in a country where homophobia is widespread and generally accepted. In neighbouring Russia, more than 20 gay activists were detained by police at an unsanctioned rally in Moscow. 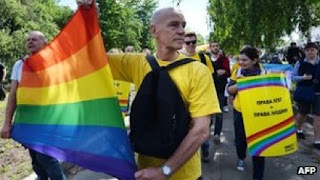 The campaigners tried to march on Russia's parliament building, denouncing what they described as "homophobic" legislation recently approved by MPs. The bill bans "gay propaganda" in an effort to protect children, but human rights campaigners say its real aim is to curb the rights of sexual minorities. In Kiev, the gay-rights activists marched outside the city centre amid a heavy police presence. "This event will go down in the history of Ukraine as one of the key developments in the fight for equal rights," Ms Semenova said. A number of protesters - including Orthodox Church members - gathered nearby to denounce the march. "Ukraine is not America, Kiev is not Sodom," they chanted. The event was held despite an earlier court ruling banning such gatherings. City authorities had argued that a gay march would clash with the annual Kiev Day festivities and could lead to violence. The authorities cited 500 complaints from the public to justify their court petition. A gay-rights event planned for last year in Kiev was called off at the last minute after a gathering of skinheads threatened participants. A recent Amnesty International report said Ukraine's gay community suffered widespread bias and abuse.